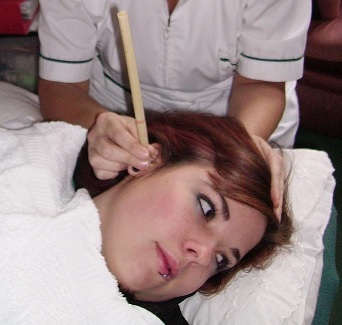 Hopi Ear Candles are a deeply relaxing, calming and soothing treatment offering real and marked benefits for many problems and conditions associated with the ear, nose and throat areas. Visit me in my salon in Pokesdown for this gentle, relaxing treatment. Enjoy soothing music as I place the lighted candle in your ear to draw out the impurities. You will hear a crackling noise as the candle burns down but you wont feel anything other than being relaxed. After I have treated both ears I will gently massage your face to assist with drainage. The candles are made from organic cotton which is dipped in a solution of honey extracts, pure beeswax, beta – carotine and traditional crushed Indian herbs, known for their therapeutic qualities, including St.John’s Wort, chamomile and sage. The burning action infuses the herbs and essential oils into a vapour which is drawn into the auditory canal. This performs a massaging function as well as softening any impurities. Gentle heat from the candles stimulates blood circulation, increases the cleansing circulation of lymph from the lymphatic system, intensifies the immune system and stimulates energy points and reflex zones. The cleansing fire carries away negative vibrations, harmonizing and balancing energy. Catarrh, Migraine, Tinnitus, Sinusitis, Glue ear and it can also help with ‘ear popping’ due to flying.